ROYAL PACK manufactures more than 30 different models of security seals. Each of our models is the result of the analysis and detection of the security needs of each of our customers and the market where they operate. An example of sector and models of specific security seals, are the containers. If we are going to seal a container, we must have an approved by the current standards security seal. Bulk tank trucks need a seal that not only seals their outlet ports, but also seals the assembly of all filling ports. 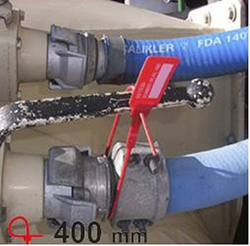 ROYAL PACK has its seal DUMBO SEAL 50/400, developed specifically to give security to all the sealing operation of a bulk tank truck, along with a morphology and technical materials that have led it to be approved by the most important companies in liquid transport of Europe.